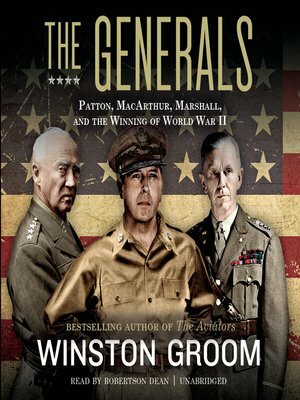 Celebrated historian Winston Groom tells the intertwined and uniquely American tales of George Patton, Douglas MacArthur, and George Marshall—from the World War I battle that shaped them to their greatest achievement: leading the allies to victory in World War II. These three remarkable men-of-arms, who rose from the gruesome hell of the First World War to become the finest generals of their generation during World War II, redefined America's ideas of military leadership and brought forth a new generation of American soldier. Their efforts revealed to the world the grit and determination that would become synonymous with America in the postwar years. Virginian George Marshall led his class at the Virginia Military Institute to become the principal planner of the Battle of the Meuse-Argonne, the greatest American operation, which ended the conflict. Afterward, he rose to become the Army's chief of staff, where he balanced the volatility of generals such as Patton and MacArthur for the good of the country. Like Marshall, George Patton, who is remembered as one of the most heroic and controversial generals in American history, overcame early academic difficulties to graduate at the top of his class at West Point. He would build and command the Army's burgeoning tank division, lead the successful invasion of North Africa during World War II, and die under mysterious circumstances in 1945. Douglas MacArthur also graduated at the top of his West Point class and became known as the "bravest man in the US Army" during the First World War, where he was commissioned as the youngest general in the armed forces. He commanded in the Pacific in World War II, where his strategy famously defeated the Empire of Japan. Filled with novel-worthy twists and turns, and set against the backdrop of the most dramatic moments of the twentieth century, The Generals is a powerful, action-packed book filled with marvelous surprises and insights into the lives of America's most celebrated warriors.